An inexpensive pedal to provide some '80s-style chorus flavour, especially if you like your effects to cut through when you kick them in. Compact size; authentic analog chorus. Four-screw battery access; sound change from bypassed to active won't suit everybody. 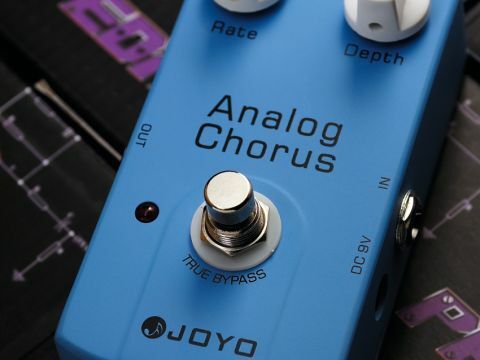 Chinese company Joyo is tempting all of us cash-strapped, effects pedal-loving guitar players with a range of inexpensive stompboxes. All are a compact size and of a solid metal construction that belies the fact they cost less than £40. The Analog Chorus is the first example we've tried, and does exactly what it says on the tin, being powered by a BBD chip. The JF37 delivers recognisable analogue chorus sound, and very nice it is too - much like a BOSS CE-2, but there's also a perceptible lift in stridency with a slight volume increase and a touch more treble.